The Changle Cemetery is located on the terrace at the north foot of Taiqing Mountain, 2.5 km south of Changle Township, Zhongwei in Ningxia. It was discovered early in 1985, covering an area of tens of thousands square meters. Incorporating with infrastructure projects, personnel from Ningxia Cultural Relics and Archaeological Institute and Antique Administrative Office in Zhongwei have conducted three excavations respectively in 2002, 2004 and 2009. Nearly 100 tombs have been uncovered, yielding over 500 various objects, which are mainly bronze coins and ceramics. Tombs vary in shapes including pit tombs, stone-chamber and brick-chamber tombs. The tomb occupants anthropologically belong to modern East Asia type Mongoloid. The tombs cover a time range from middle Western Han to early and middle Eastern Han dynasty. 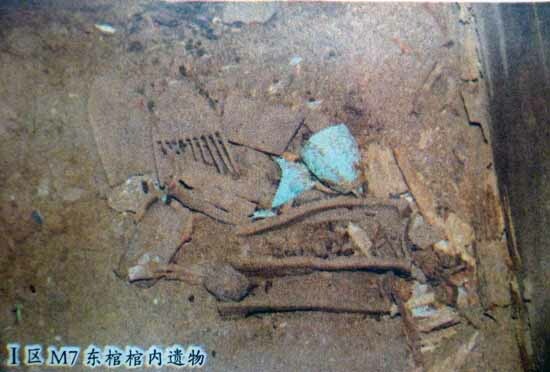 From April to July 2012 the fourth excavation have been undertaken by personnel from Ningxia Cultural Relics and Archaeological Institute, aiming to uncover the south part of the cemetery. According to geographical features, two areas, Area I and II, ca. 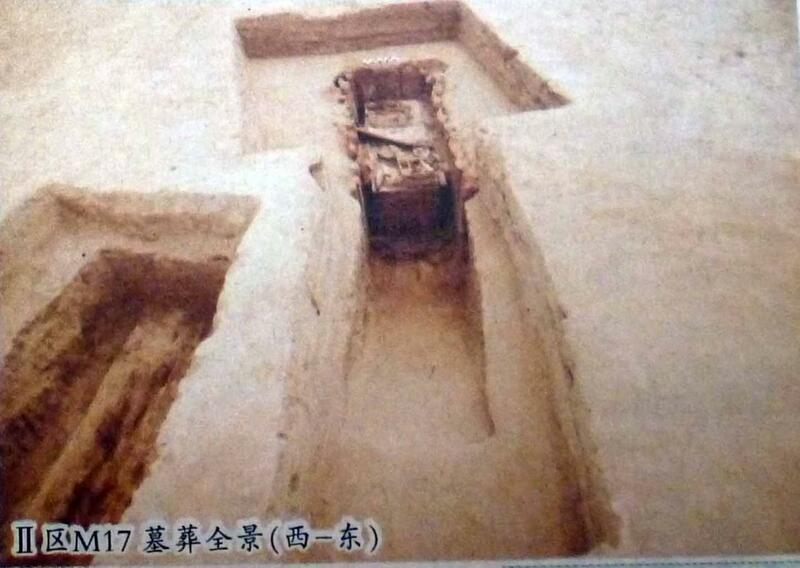 300 m apart, are planned and excavated, bringing about 25 tombs, 24 from Han dynasty and 1 from Qing Dynasty. As to the Han tombs, six of them are double burials and one is single burial. Area I contains 12 tombs. 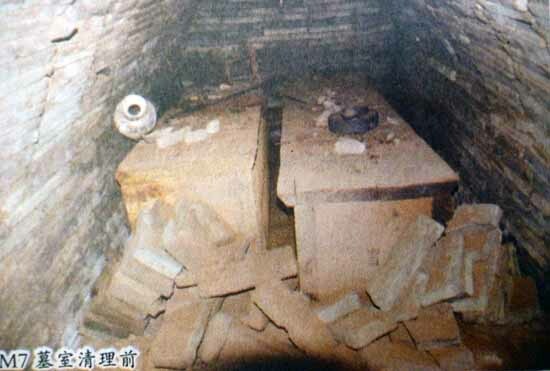 Except Tomb 10 from Qing Dynasty, all the others are from Han Dynasty. Tombs are densely arranged, varying in shapes and without any form of overlapping. There are 3 small-sized rectangular pit tombs, and all the rest are middle sized cave-chamber tombs with a passage in south-north direction and with the plane in the shape of “凸”. Two of them are brick-chamber tombs, one is stone-chamber tomb and five are cave-chamber tombs containing wooden outer-coffins. Area II contains 13 tombs, all from the Han period. They are densely distributed too. There are six small sized rectangular pit tomb and seven middle sized cave-chamber tombs containing wooden outer-coffins with a passage in east-west direction and with the plane in the shape of “凸”. 30 human skeletons have been found, including 12 males and 15 females. Their death ages are mainly concentrated in the youth age from 25 to 35. Most of tombs have been robbed soon after buried. Skeletons have been moved and are in poor state of conservation. The burial objects are mainly ceramics, lacquer and wooden wares, bronze coins and some models of horses and chariots. Tomb occupants could be ordinary frontiers people. Ceramics include models of jars, pots, kitchen ranges, cauldrons, steamers and lamps. Bronze objects are mirrors, belt hooks and bells. Lacquer wares include boxes, trays, ear cups and chopsticks, most of which are painted, with clouds as the main pattern. Wooden objects include models of trays, canes with a bird’s head, figurines, chariots and pestles, as well as functional objects like combs, seals and canes. Bronze coins are mainly Huobu, Huoquan from Wang Mang period and Wuzhu from Emperor Wu to Emperor Xuan. Among them Dabu Huangqian and Rendao Wubai from Wang Mang period, are really rare among contemporary coins. There are some other slicker solder models, glass models and other ornaments.